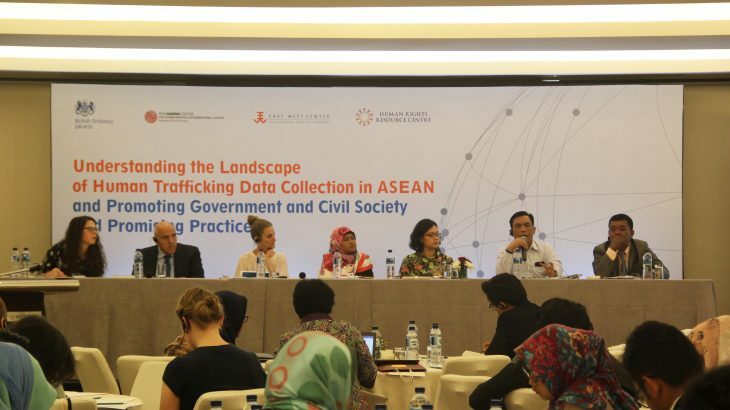 Jakarta, 29 March 2018 – The Human Rights Resource Centre (HRRC) and the WSD Handa Center for Human Rights and International Justice at Stanford University (WSD Handa Center) successfully launched the results of the study “Understanding the Landscape of Human Trafficking Data Collection in ASEAN and Promoting Government- and Civil Society-Led Promising Practices” on 29 March 2018 at the Le Meridien Hotel, Jakarta, Indonesia. Prof. Dr. David Cohen, Director of WSD Handa Center, opened the launch and welcomed the distinguished guests composed of representatives from the ASEAN Senior Officials Meeting on Transnational Crime (SOMTC), the ASEAN Commission on the Promotion and the Protection of the Rights of Women and Children (ACWC), the ASEAN Intergovernmental Commission on Human Rights (AICHR), the ASEAN Secretariat, the diplomatic community, government ministries, and civil society organisations involved in anti-trafficking in persons efforts in the region. Ms. Jessie Brunner, Lead Researcher and Program Manager of WSD Handa Center, in presenting the highlights of the findings of the nine-month study, stressed the importance of good data to the anti-trafficking movement and the need to understand existing data systems across the region, particularly in light of the recently ratification of the ASEAN Convention Against Trafficking in Persons, Especially Women and Children (ACTIP) with provisions relevant to data collection, including the development of a regional database for trafficking in persons. Through interviews with 75 civil society and government agencies in Cambodia, Indonesia, the Philippines, and Thailand, the lead researcher was able to identify challenges commonly faced regarding data collection as well as promising practices in these countries. She observed that the benefits of digital data are not being fully utilized, there is lack of infrastructure and technical support for data security, database is viewed as an outcome and not as resources, and task forces have not realized their full potential as data hubs. She nevertheless found promising practices from the four ASEAN Member States: the victim identification standards being implemented in Cambodia, the one data policy initiative in Indonesia, the anti-trafficking in persons legislation in the Philippines that clearly stipulates the relevant rules on the issue, and the unified database in Thailand that allows the inputting of data by different government entities into a single system. These findings are encapsulated in a policy report and in the guidelines “Getting to Good Human Trafficking Data: Everyday Guidelines for Frontline Practitioners in Southeast Asia”. The presentation was followed by insightful commentaries from an esteemed panel of leaders in human rights and anti-trafficking efforts in the region: H.E. Ms. Yuyum Fhahni Paryani, Indonesia’s Representative on Children’s Rights to the ASEAN Commission on the Promotion and the Protection of the Rights of Women and Children, H.E. Dr. Dinna Wisnu, Indonesia’s Representative to the ASEAN Intergovernmental Commission on Human Rights, Police Comm. Rz. Panca Putra, SOMTC Indonesia Representative, Police Major Gen. Reaksmey Sok, SOMTC Cambodia Representative, and Ms. Susan Ward, Chief of Party of the Asia Counter Trafficking in Persons Program of Winrock International. 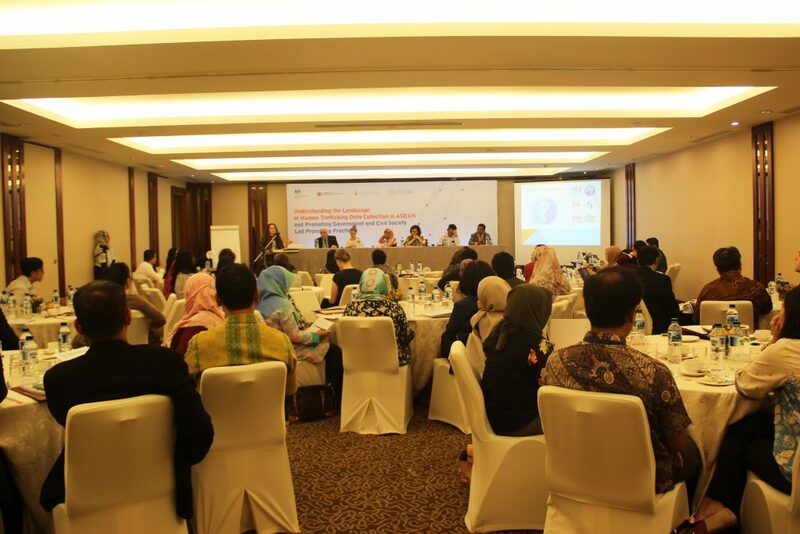 The panel commentaries were complemented by astute comments and questions from participants in an open forum and the event was capped with spirited closing messages from Ms. Theresa O’Mahony-Heer, Political Counsellor of the British Embassy Jakarta, and Prof. Harkristuti Harkrisnowo, Executive Director of HRRC. The study is made possible with the generous support of the British Embassy Jakarta and contribution from the East-West Center. ACMW, ACTIP, ACWC, AICHR, ASEAN, News SOMTC, TIP, Trafficking in Persons. permalink.